You would never say the Vice President of Quality for McDonalds is responsible for quality outcomes. You would never think the Vice President of Customer Service for Costco is responsible for the actual service delivered (good or bad) in every store. And no one expects the Vice President of Safety to be held accountable for the actual execution of every safety procedure. In all three instances we recognize the individual with the title (or the department taking the lead) is responsible for ensuring there are guidelines and policies in place. They are responsible for implementing education, systems and best practices that support high standards. But the actual achievement of quality, customer service and safety relies on the behaviors of people enterprise-wide. The success of inclusion initiatives is exactly the same. There might be a VP for Diversity and Inclusion; or the Inclusion Initiative might be coordinated by the VP of Human Resources. But the actual responsibility for breathing life into the organization’s commitment to be inclusive is distributed throughout the organization. Each manager and supervisor is responsible for communicating the company’s expectations and modeling appropriate behavior. Every individual employee either helps, or hinders, the creation of an inclusive work environment based on what they do and say on a daily basis. Every one of us contributes daily to whether or not our organizations meet the standards that have been established. So, this week … look for opportunities to set a good example. This week, remember that inclusion is an enterprise-wide initiative and you have a vital role to play. I was sitting in a meeting. The discussion was about creating a small leadership team to put some structure around a special project and create the policies, procedures and practices to be implemented. The participants that made up the entire project group were already identified and represented five different locations. What needed to be done now was select a lead team. But the only criteria everyone else was talking about was location. This is one of the big problems with a representational model. All too often I get called in to work with an organization on up-leveling their inclusion strategy and one of the biggest barriers to change is that in the past everything they did was based on ethnic and gender representation. So even though they want to make a change, the conversation they are accustomed to having just sounds like there is a quota to be sure there is at least one African American person, an employee who is Hispanic, one person who is supposed to represent LBGT employees, at least 3 women, etc. Now, don’t get me wrong. I believe 100% in inclusion. I just believe that it is an invitation to disaster to put a demographic category ahead of identifying the specific skills required to do the task at hand. I also believe that there are times when you can place someone whose skills are not proven but whose potential is high into a given slot. But that means the skill level has been discussed and there is someone they will be working with who is assigned the role of mentoring and supporting and helping to develop the required skills. If there is no conversation about skills then this type of planning just won’t happen. When your organization tends to use the representational model you also set up the unspoken cultural belief that people may not have the skills required and they are in the role they are in because their race, gender, location, sexual orientation, etc must be represented. When this is the norm, people begin to assume that people are in roles they don’t have the skills or experience for. I can’t even count how many times I’ve been discounted because, without looking at my resume and without having a conversation with me, people in the organization talk to me as if I have no idea what is going on or what I need to do. My favorite example of this is when I became active in a certain professional organization. I had been earning a 6-figure salary for several years. I had a list of honors and awards that was pretty impressive. But in conversation after conversation it became clear that because I was black the majority of the (white) members assumed I had no experience and believed they needed to tell me very basic information about the profession that I was already successful in. Or they would ask me if one of the 2 existing black members had brought me in because, if not, I would definitely need one of them to be my mentor. Rather than irritating me, it became pretty funny. Dozens of people felt they were doing me a favor. Many shared they just wanted to help me so that one day, with their guidance, I might be able to rise to a 6-figure salary. They were quick to share that they hadn’t reached that point yet but they were well on their way thanks to what they were learning in this association. It was clear the majority of people were comfortable with me being there as long as I was someone they could help or teach, but not as a peer … and definitely not as someone who had experience they might learn from. Boards I was invited to join “because we want to have more diversity” were careful to screen to be sure I had the skills needed … but often, once I accepted the appointment, I would realize nothing had been done to ensure existing Board members would share information, encourage participation or do anything that would result in a positive relationship being built. 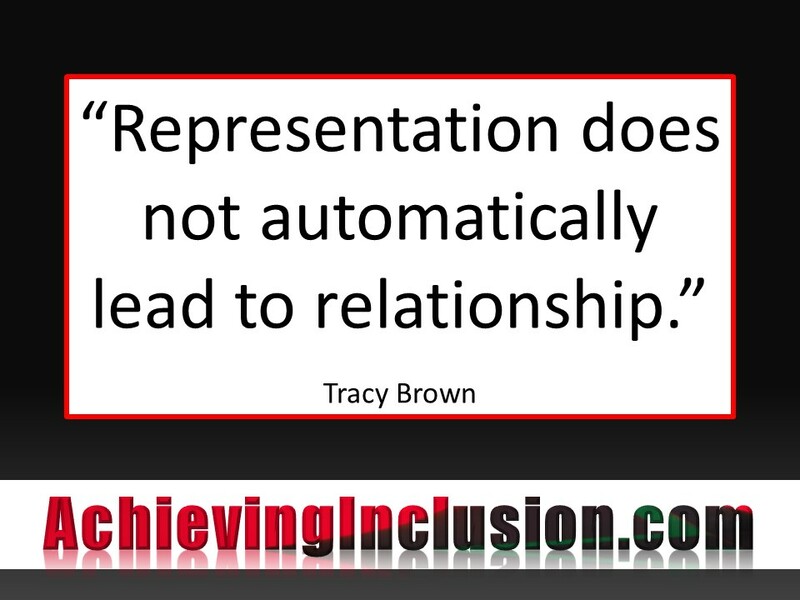 Representation does not automatically lead to relationships that help to get the work done. Many times I’ve advised clients that recruiting a black person to their Board of Directors or to their executive team does not necessarily mean they are improving or strengthening their connection to the black community. I’ve seen hundreds of examples where the person selected to “represent” a certain community turns into a disaster. The employee with a Hispanic surname who has no ties to the Latino community and doesn’t speak Spanish. The female manager hired to represent women whose reputation is that she is harder on women who report to her and has 40% turnover of female employees in her departments. The black employee who grew up in a “Huxtable” family, went to private schools and an Ivy League college but is expected to go out and sell or serve the black community in an urban market. Get the idea? I’m not suggesting we ignore representation; it’s an important part of the inclusion puzzle. Just don’t allow representation to be your starting point. The City Councilman who is white but keeps beating Hispanic challengers election after election because he spends so much time with the people who elected him and has been so responsive to their needs that they trust and admire him. The heterosexual ally the LGBT employees asked to be their executive sponsor because he had spoken out about homophobia and spoken up for benefits equity for LGBT employees on a regular basis over the years. The VP of HR who established what she referred to as “reverse mentoring” relationships where senior leaders were purposefully paired with mid-level employees from different ethnic groups and different functional groups to ensure the leaders were receiving input from employees they might not normally engage with. So, enough about the problem, Tracy! What suggestions do you have for leaders who want to do it differently? First, focus on the job-related requirements. What has to happen for the person selected to be considered successful? What kinds of experiences might someone have had before that would give him the experience he needs to do this job? Are there any specific educational requirements? What are skills or traits that must be avoided if the person in this position is to be effective? Next: Only after you have a base group of people who have the skills and experiences required can you consider how to also demonstrate commitment to diversity and inclusion. And third: prepare the people throughout the organization or team with information about the criteria used and the confidence you have in whomever has been selected. This helps to break down the assumption that someone is serving primarily because of the location or identity group they represent. Finally: Give serious consideration to any behavioral expectations you have of the rest of the group. If existing norms and past patterns have not laid the foundation for the current employees to build authentic relationships with people who seem different, then it is important to address this in a proactive way. In the example I began with, selecting a leadership team for a project, the big problem is that there are many people with great interest and deep passion who have been selected to serve on the larger team but relatively few who have experience creating (and then managing) a complex program structure that calls for proactive communication, strong program marketing and both participant and program evaluation systems. Luckily, within the larger group many different people have one or more of the required skills or experience. So in this case it’s critical that the leadership team selected must also be comfortable tapping in to the skill base within the group rather than thinking that because they are the designated leaders they are supposed to do it all themselves. Selecting the leadership team based on the facility where they work is not likely to generate the best result. But once the group of people who do have the skills is identified, then it makes perfect sense to add a filter based on a desire to have as many different facilities as possible represented. So … don’t ignore representation. Just clarify, communicate and be guided by the required skills and experience first. If your diversity strategy still revolves around pot luck meals and the music or cultural celebrations of different cultures then you are missing important opportunities to connect diversity and inclusion with your business success. If you want employees in general, and managers specifically, to pay attention to your organization’s commitment to diversity and inclusion, then it is imperative that you make a direct link to productivity, market share, customer satisfaction, employee retention, increased revenue or some other business-focused outcome. At Diversity Trends LLC we specialize in helping your organization identify and use the business strategy that makes diversity and inclusion an essential part of their culture. Executives from a variety of companies answer the question, “Why is it important to pay attention to diversity?” Do you agree? Are there additional reasons you would add? Some of the ways IBM marries diversity and business results are shared in this brief video excerpt from a recent diversity conference.